1. Pull up the seatback recline lever. 2. Hold the lever and adjust the seatback of the seat to the position you desire. 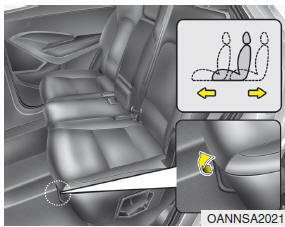 The rear seat(s) is equipped with headrests in all the seating positions for the occupant's safety and comfort. Do not adjust the headrest height while the vehicle is in motion. 1. 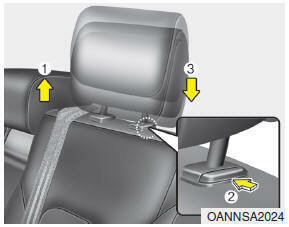 Raise it as far as it can go then press the release button (1) while pulling the headrest up (2). 1. Put the headrest poles (3) into the holes while pressing the release button (1). After installing the headrest, make sure that it is installed in the right direction. 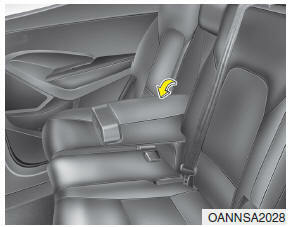 A headrest installed reversely could increase whiplash injury during rear impact. To use the armrest, pull it forward from the seatback. The seat warmer is provided to warm the rear seats during cold weather. 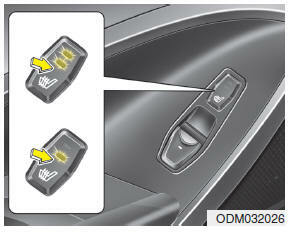 With the ignition switch in the ON position, push either of the switches to warm rear seats. 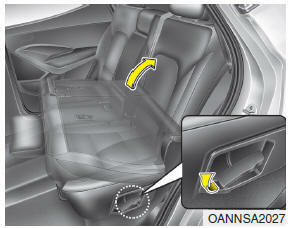 The rear seatbacks can be folded to facilitate carrying long items or to increase the luggage capacity of the vehicle. Never allow passengers to sit on top of the folded down seatback while the vehicle is moving. This is not a proper seating position and no seat belts are available for use. This could result in serious injury or death in case of an accident or sudden stop. 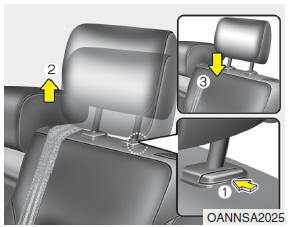 Objects carried on the folded down seatback should not extend higher than the top of the front seatbacks. Doing this could allow cargo to slide forward and cause injury or damage during sudden stops. 1. 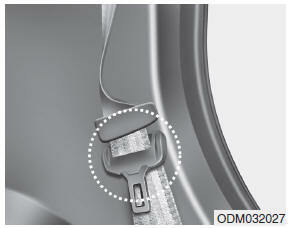 Insert the rear seat belt buckle in the pocket between the rear seatback and cushion, and insert the rear seat belt webbing in the guide to prevent the seat belt from being damaged. 2. 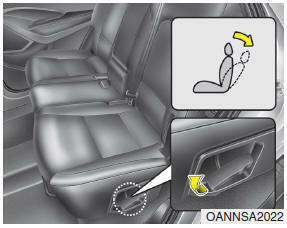 Set the front seatback to the upright position and if necessary, slide the front seat forward. 3. 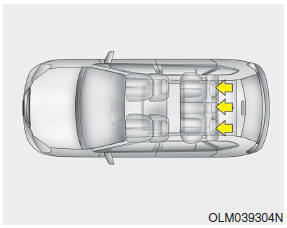 Lower the rear headrests to the lowest position. 4. 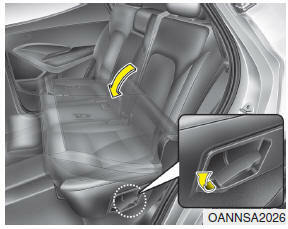 Pull on the seatback folding lever, then fold the seat toward the front of the vehicle. When you return the seatback to its upright position, always be sure it has locked into position by pushing on the top of the seatback. 5. 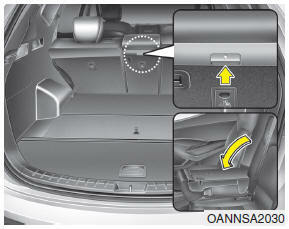 To use the rear seat, lift and pull the seatback backward by pulling on the folding lever. Pull the seatback firmly until it clicks into place. Make sure the seatback is locked in place. 6. Return the rear seat belt to the proper position. Pull the rear seat back folding lever out. The rear seat back will be folded. If you pull the left side lever (1) out, left side seat back and center seat back will be folded. If you pull the right side lever (2) out, right side seat back will be folded. Do not fold the rear seat. 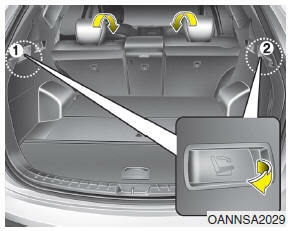 If passengers, pets or luggage are in the rear seats. It may cause injury or damage to passengers, pets, luggage.